This is our one day special lunch bowl to go on March 3rd. 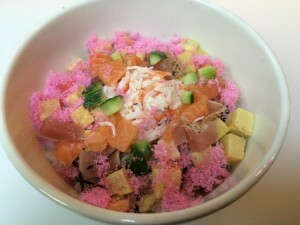 Salmon, albacore tuna, fake crab, sweet pink fish flakes, cucumber, egg, sea weed, and tempura flakes on top of sushi rice. March 3rd is Japanese Girls’ Festival Day, Hinamatsuri. We have a custom to eat Chirashi-sushi on the day of Hinamatsuri. Now we have new desert. Why don’t you try this at the special day? 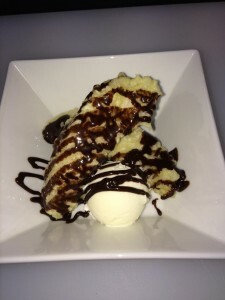 Banana beignet with ice cream and chocolate sauce.